KOLWEZI, DEMOCRATIC REPUBLIC OF CONGO – Robert Friedland and Yufeng "Miles" Sun, Co-Chairmen of Ivanhoe Mines (TSX: IVN; OTCQX: IVPAF), announced today that exploration drilling at the Kamoa North prospect area, on the 397-square-kilometre Kamoa-Kakula mining licence, approximately 25 kilometres west of the mining centre of Kolwezi in the Democratic Republic of Congo (DRC), has successfully delineated two new, continuous corridors of shallow copper mineralization containing zones of thick, high-grade copper. The newly delineated copper corridors occur on the western flank of the un-mineralized Kamoa Dome at Kamoa North. The most significant corridor trends north and south for more than nine kilometres before swinging to the northwest and is projected to continue onto the adjacent Western Foreland exploration licences that are 100%-owned by Ivanhoe Mines. The second corridor trends west-southwest, away from the Kamoa Dome and toward the West Scarp Fault, over a distance of three to four kilometres. "Our latest exploration success, at Kamoa North, provides additional options for mine planning and sequencing at Kamoa-Kakula," said Mr. Friedland. "The unparalleled strength and continuity of the high-grade mineralized trends on the Kamoa-Kakula Project also bode well for the potential for further success right next door, on Ivanhoe's 700-square-kilometre Western Foreland exploration licences, north and west of Kamoa-Kakula." The tier-one Kamoa-Kakula Project is a joint venture between Ivanhoe Mines, Zijin Mining and the DRC government. An independent Mineral Resource estimate published last February established Kamoa-Kakula as the world's fourth-largest copper discovery. 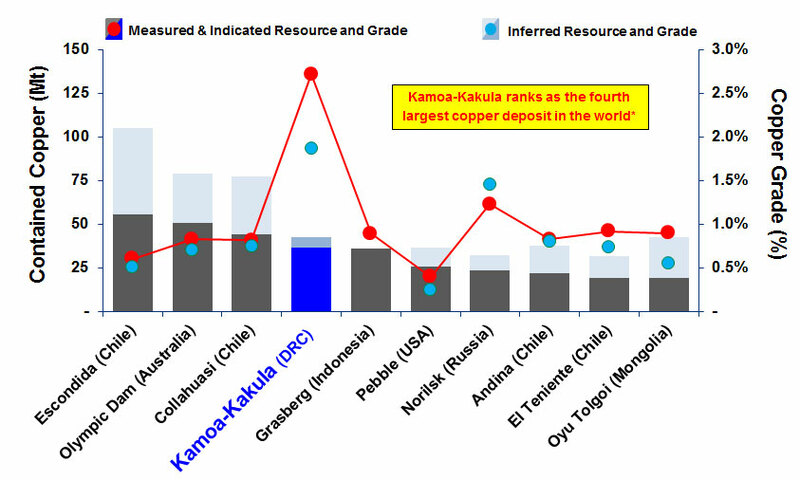 Kamoa-Kakula's copper grades are the highest, by a wide margin, of the world's top 10 copper deposits (see Figure 9, page 14). 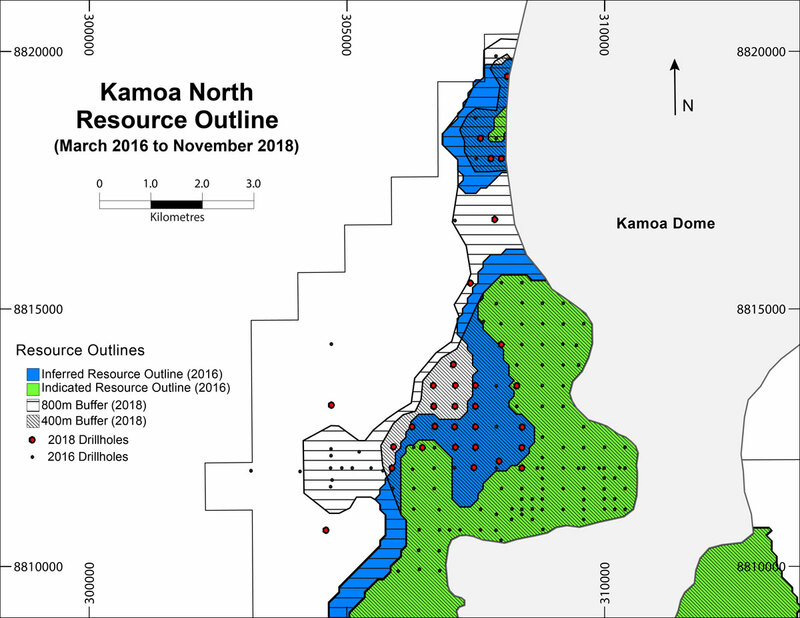 The Kamoa North Exploration Area is approximately 12 kilometres north of Kamoa's Kansoko Mine development and approximately 20 kilometres north of the Kamoa-Kakula Project's planned initial mine at the Kakula Deposit (see Figure 1, page 2). The discovery area already is accessible by an all-season road that connects with the provincial road to Kolwezi and is close to the newly installed electricity line running from Kamoa North to the planned Kansoko and Kakula mines. adjacent Western Foreland exploration-licence area. *Grade contours in the Kamoa North exploration area in Figure 1 are for illustration purposes only. See Figure 3 and Figure 4 for actual contours of copper grade at Kamoa North for 1% and 2% composites. Exploration drilling in 2017 and 2018 in the Kamoa North area targeted structural- and lithological-controlled grade trends recognized during the targeting reviews in early 2017 that identified multiple target areas on the Kamoa-Kakula mining licence. Continuity of copper grades along these trends has been largely confirmed. 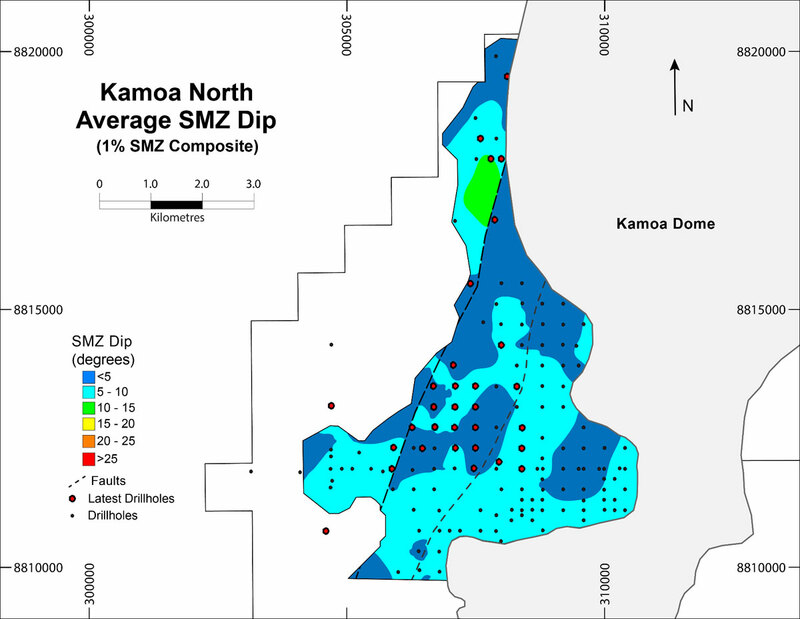 Drilling will continue in 2018 and early 2019, with the intention of updating the Kamoa North Mineral Resource area in 2019. The newly delineated copper corridors are indicated with dashed and dotted lines in figures 3 and 4 (pages 6 and 7). The corridors are partly within the previously defined Inferred Mineral Resources, but the definition provided by additional drilling has allowed significantly increased continuity of grade to be established and then extended along strike into previously untested areas. The recognition of high-grade trends in areas previously tested by wider-spaced drilling reflects a growing understanding of the controls on mineralization at Kamoa-Kakula (Figure 6). Mineralization thicknesses range from three metres up to 18 metres at a 1% copper cut-off. The mineralized horizon generally is in the region of 150 metres to 300 metres below surface, except on the west side of the West Scarp Fault (see Figure 2), where it strikes roughly north–south and dips gently to the west at between five and 10 degrees (see Figure 7). Sulphide mineralization at Kamoa North tends to be bottom-loaded and shows typical downward zonation from chalcopyrite to bornite to chalcocite. Chalcopyrite dominates in the lower grade intercepts and when mineralization extends into the overlying pyritic siltstone. Fine-grained bornite and chalcocite dominate in the highest-grade intersections (see Figure 8). DD1396 intersected 18.26 metres (true width) of 5.73% copper, at a 1.0% copper cut-off, and 17.27 metres (true width) of 5.98% copper at a 2.0% copper cut-off, from a downhole depth of 233.60 metres. DD1382 intersected 8.05 metres (true width) of 4.45% copper, at a 1.0% copper cut-off, and 7.55 metres (true width) of 4.66% copper at a 2.0% copper cut-off, from a downhole depth of 199.5 metres. DD1213 intersected 6.97 metres (true width) of 4.08% copper at a 1.0% copper cut-off, and 6.44 metres (true width) of 4.26% copper, at a 2.0% copper cut-off, from a downhole depth of 226.45 metres. DD1406 intersected 14.92 metres (true width) of 3.18% copper at a 1.0% copper cut-off, and 7.26 metres (true width) of 4.54% copper, at a 2.0% copper cut-off, from a downhole depth of 231 metres. DD1408 intersected 5.99 metres (true width) of 5.26% copper at a 1.0% copper cut-off, and 4.45 metres (true width) of 6.88% copper, at a 2.0% copper cut-off, from a downhole depth of 527 metres. 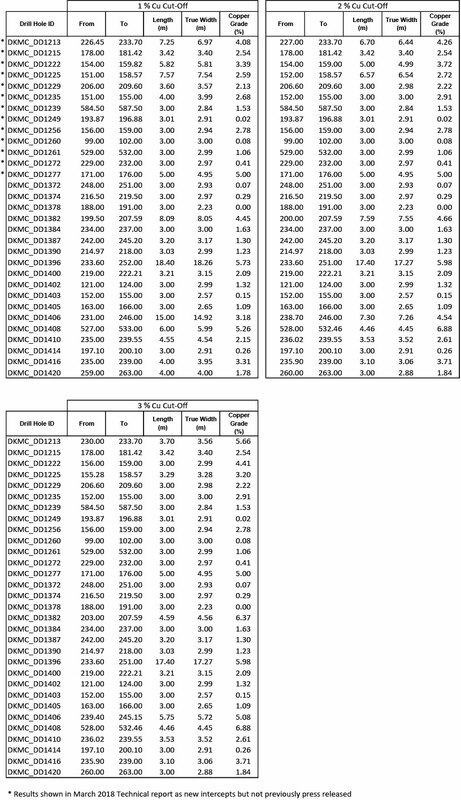 Table 1, on page 12, contains a complete list of assay results, at 1% and 2% copper cut-offs, for the drill holes completed at Kamoa North since the last resource update. 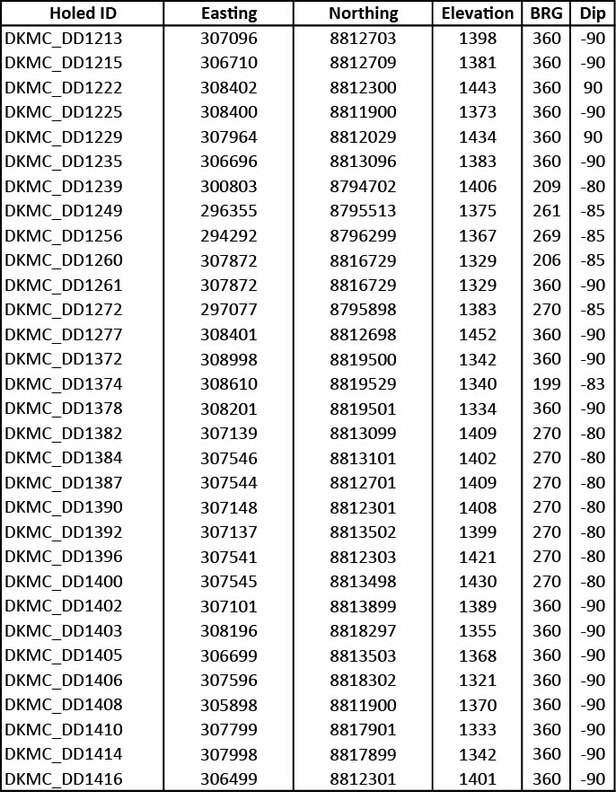 Table 1 includes 13 holes drilled in 2017 that were included in the March 2018 Kamoa-Kakula Technical Report as drilling completed since the effective date of the Resource estimate. "The discovery of these new, high-grade zones at Kamoa North clearly demonstrate Kamoa-Kakula's remarkable potential to significantly increase the project's current copper resources," said Mr. Friedland. "Kamoa-Kakula already is the world's fourth-largest copper discovery on the planet in terms of contained copper. 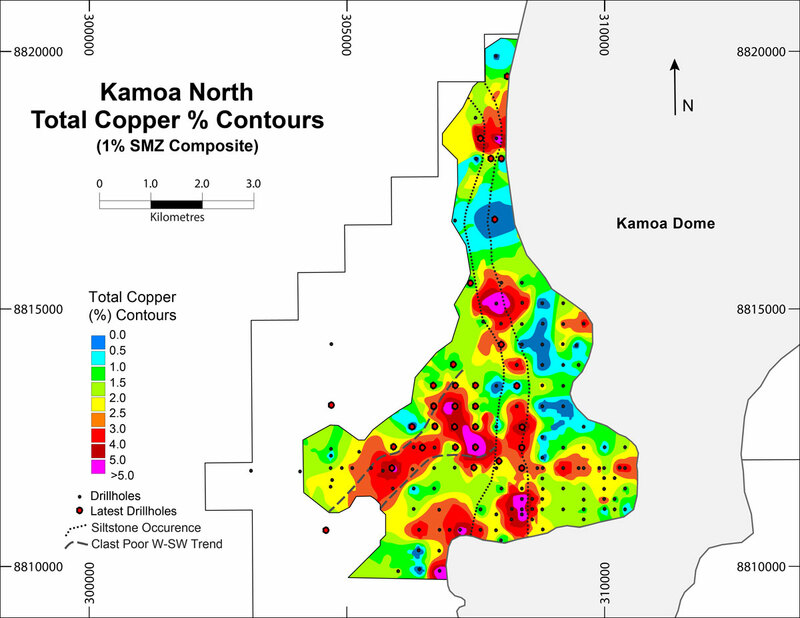 "What our mining engineers find particularly attractive about the Kamoa North discovery is that the copper mineralization is thick, flat lying and relatively shallow. The high-grade copper also is generally bottom-loaded, similar to our earlier Kakula and Makoko discoveries, and should be ideally suited to mining at elevated copper cut-off grades." Mr. Friedland reiterated that Ivanhoe and Zijin are firmly committed to fast-tracking Kamoa-Kakula's first mining operation at Kakula. "Based on the findings of the independent preliminary economic assessment completed a year ago, the resources we've discovered at Kakula should allow Ivanhoe and Zijin to build a world-scale, highly-mechanized, underground copper mine producing at an initial mining rate of six million tonnes a year, and potentially amenable to subsequent stages of phased mine expansions up to 18 million tonnes a year, and beyond." Ivanhoe and Zijin are continuing with exploration and step-out drilling around the presently defined Mineral Resource boundaries at the Kamoa and Kakula discoveries. Eight drills are operating at Kamoa-Kakula. One rig is drilling resource-extension holes at Kakula Main; two rigs are drilling infill holes at Kakula West; three rigs are drilling step-out holes at Kakula West; and two rigs are drilling exploration/step-out holes at Kamoa North. Approximately 74,000 metres of a planned 81,000-metre, 2018 drilling program have been completed to date this year. The pre-feasibility study (PFS) for the planned, initial six million-tonne-per-annum (Mtpa) Kakula Mine is expected to be completed early in 2019. This PFS will provide more detailed information related to the project's economic assumptions and will incorporate results from detailed engineering and optimization work. Ivanhoe and Zijin also are exploring potential options to expand future production. The 2017 PEA noted the potential for a 12 Mtpa scenario, to be achieved through the sequential development of both the Kakula and Kansoko mines. Based on subsequent discoveries, including Kakula West, Ivanhoe and Zijin also are exploring the potential for expanding production to 18 Mtpa, and beyond. The newly delineated, high-grade zones are near surface and flat lying. Given this depth and dip, they could be amenable to traditional, non-fill room-and-pillar-style mining that can provide high mining recovery, is highly productive and economically efficient. Mr. Friedland said that potential construction of an additional shallow access decline in the Kamoa North area will be studied, which would expand the range of options presently being considered for the development of Kamoa-Kakula. "We remain confident that there are more high-grade copper discoveries to be made in the area and that the ultimate scale of mining operations at Kamoa-Kakula will be much larger than currently modelled by a number of analysts and investors," Mr. Friedland added. "Additional exploration successes could have a significant influence on the scale, value and timing of the overall development plan. Our Kamoa-Kakula plans will be reassessed and amended as supported by our discoveries." Figure 2. Collar location plan, showing depth to top of SMZ. Figure 3. Contours of copper grade for 1% composites. Figure 4. Contours of copper grade for 2% composites. Figure 5. Contours of true width for 1% composites. Figure 6. New drill-hole positions relative to current resource areas. Figure 7. Contours of average dip at Kamoa North. Figure 8. 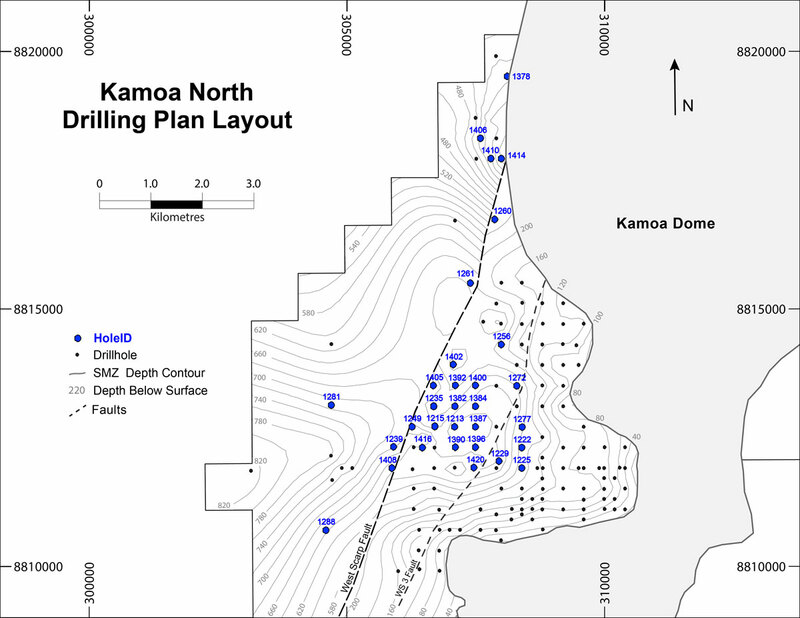 Mineralization profiles for recent drill holes at Kamoa North. Table 2. Collar co-ordinates of recent exploration results. Underground development work on the twin declines at the Kakula Copper Discovery is progressing according to plan. The service and conveyor declines each have been advanced more than 1,000 metres through underground development work. The Kakula decline development work is being undertaken by JMMC, a DRC subsidiary of JCHX Mining Management of Beijing, China. Depending on ground conditions, the 3,535-metre decline development contract is scheduled for completion by the end of 2018. Initial mine development is planned to begin at the Kakula Deposit in a flat, near-surface zone along the deposit's axis. Based on the findings of the independent preliminary economic assessment completed in November of last year, Kakula's copper grade is projected to average 6.4% over the first 10 years of production. Research by Wood Mackenzie also confirms that the Kamoa-Kakula Project is the world's largest, high-grade (> 2.5% copper grade) copper deposit and the world's largest, undeveloped copper deposit, based on contained copper in the project's Measured and Indicated Mineral Resources. Ivanhoe Mines maintains a comprehensive chain of custody and quality assurance and quality control (QA/QC) program on assays from its Kamoa-Kakula Project. Half-sawn core is processed at the Kamoa-Kakula on-site preparation laboratory and prepared samples then are shipped by secure courier to Bureau Veritas Minerals (BVM) Laboratories in Australia, an ISO17025-accredited facility. 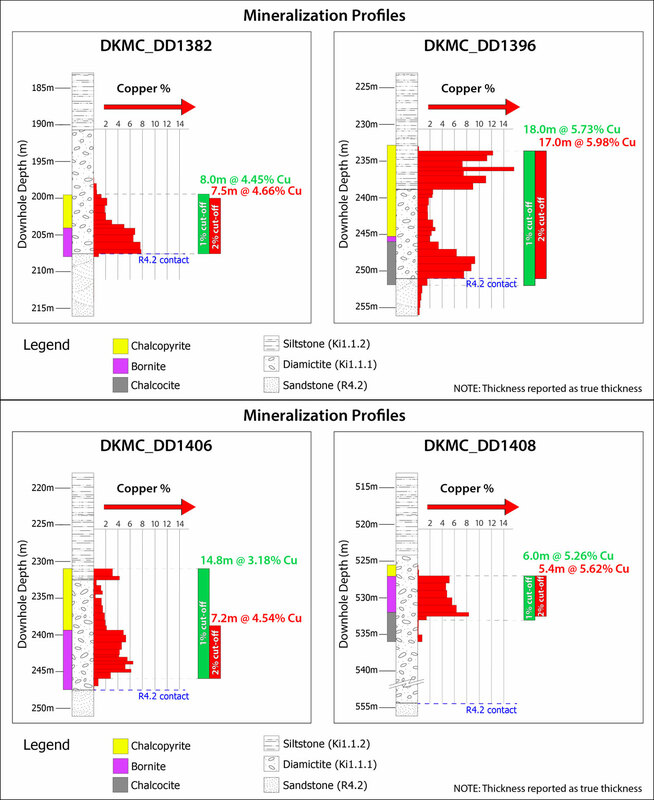 Copper assays are determined at BVM by mixed-acid digestion with ICP finish. Industry-standard certified reference materials and blanks are inserted into the sample stream prior to dispatch to BVM. For detailed information about assay methods and data verification measures used to support the scientific and technical information, please refer to the March 2018 technical report titled, "Kamoa-Kakula Project – the Kamoa-Kakula 2018 Resource Update", on the Ivanhoe Mines SEDAR profile at www.sedar.com and available at www.ivanhoemines.com. 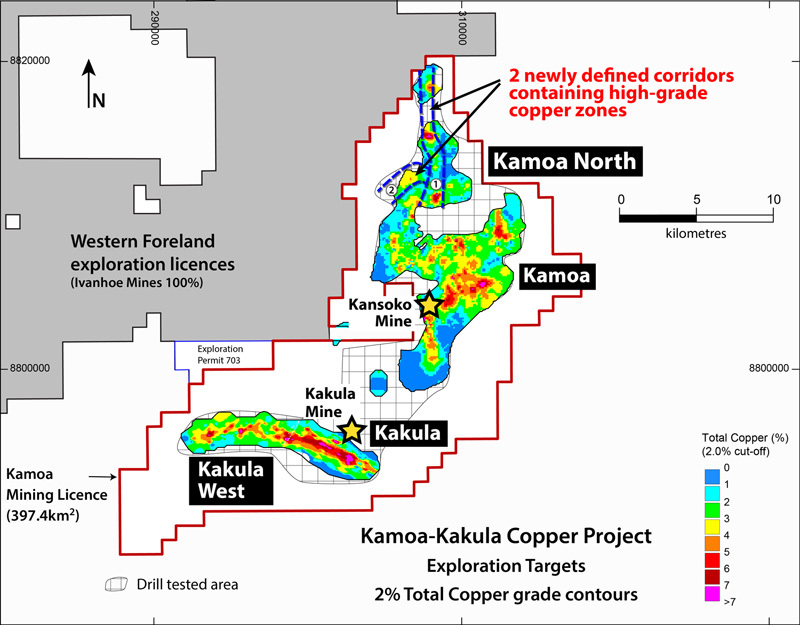 Certain statements in this release constitute "forward-looking statements" or "forward-looking information" within the meaning of applicable securities laws, including without limitation, statements regarding the completion of a PFS for an initial 6 Mpta Kakula Mine in early 2019; updating the Kamoa North mineral resources in 2019; the completion of the Kakula decline development work by the end of 2018; and statements regarding planned and expected rates of production and mine life. Resources that are not Mineral Reserves do not have demonstrated economic viability. The accuracy of any such estimates is a function of the quantity and quality of available data, and of the assumptions made and judgments used in engineering and geological interpretation, which may prove to be unreliable and depend, to a certain extent, upon the analysis of drilling results and statistical inferences that may ultimately prove to be inaccurate.